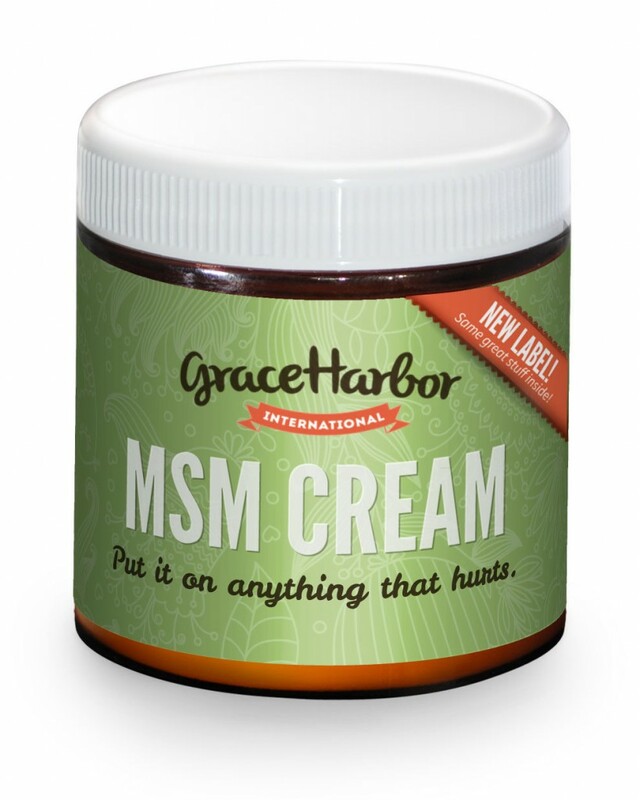 This 4 oz Jar of Grace Harbor Farms MSM Therapeutic Cream is Handcrafted in the USA. 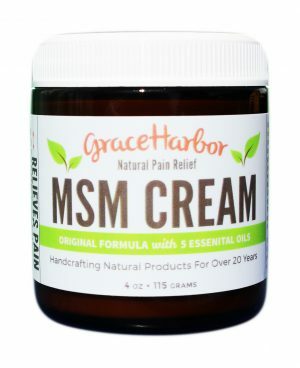 This amazing, handcrafted MSM therapeutic cream from Washington State is the perfect finish to an electrical stimulation session, soothing your sore muscles, joints, wrists and ankles. It’s equally fantastic on the bottom of your feet! The small-batch formulation is built on a foundation of purified water and fresh goats’ milk. The goats’ milk easily penetrates and absorbs into the skin due to its small protein and fat molecules. It has the effect of nourishing and hydrating the skin cells, helping it appear smooth and supple. Quality and purity is ensured by producing small batches with ingredients that are natural and as unprocessed as possible, with a naturally occurring fragrance derived from the essential oils used in the formula. The base is just the beginning. Along with natural ingredients including coconut oil, avocado oil, and Vitamin E, the therapeutic cream also contains methylsulfonylmethane (MSM) as it’s main active ingredient. MSM is a naturally anti-inflammatory sulfur compound. Read more about MSM. “The nutrient MSM is a naturally-occurring sulfur compound found in all vertebrates including humans.” – Dr. Mercola, DO, Director of Technical Development at Bergstrom Nutrition. – See video interview at bottom of page. This is filled with natural essential oils such as lavender, rosemary, and tea tree oil. The essential oils are natural antiseptics and antibiotics and the blend of oils contains eucalyptus and peppermint. Read about all of the five oils in the essential oil blend and their healing properties below. Stock this all-purpose skin care and pain relief MSM therapeutic cream in your home, car, and camper. Use this 100% natural cream as needed for pain relief and for promoting healing. Apply to all aches and pains including arthritis pain, joint or muscle injuries, stiffness, soreness, bug bites, burns, scratches, and dry skin. Containing the natural antiseptic and antibiotic essential oils, the cream is widely used to ease muscle aches and painful joints. 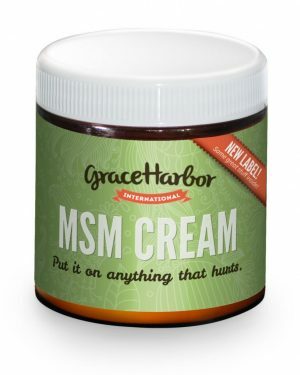 MSM is also a natural anti-inflammatory. Peppermint–has an enlivening effect. It is antiseptic, antiviral and antispasmodic. It can relieve headaches and fatigue. It can clear the head and aid concentration. Eucalyptus–used to sooth wounds, asthma, colds and fever is antifungal against Athlete’s foot and Candida, and eases muscular aches and pains. It is an insect repellent, soothes burns, and eases breathing. Tea Tree Oil–strongest natural anti-septic known, also anti-fungal, anti-viral, and a strong immuno-stimulate. Used to sooth cracked skin, itchy scalp, pimples, cold sores, warts, and sunburns. Lavender–relaxing, reduces stress, aids sleep, rejuvenates skin, speeds cell replacement, helps acne, soothes Rosacea and eczema, promotes healing and reduces scarring. It also improves circulation and muscle tone. It reduces cellulite and fluid retention. It’s hard to describe the amazingly therapeutic aroma that springs from jar as soon as you open it. I personally believe that just using this as aromatherapy is worth the price! Ingredients: Water, Pasteurized Goat Milk, MSM (Methylsuflonylmethane), Avocado Oil, Coconut Oil, Emulsifying Wax (Cetylstearyl Alcohol, Polysorbate 80), Stearic Acid, Vegetable Glycerin, Peppermint Essential Oil, Rosemary Essential Oil, Eucalyptus Essential Oil, Citric Acid, Lavender Essential Oil, Tea Tree Oil, Vitamin E and Grapefruit Seed Extract. Avoid using close to your eyes. I purchased this for my mother to use for the joints in her fingers. I was surprised how quickly it worked for her! I suspected it would take at least a couple of applications because of it’s homeopathic nature but she actually noticed relief right away. Now she keeps it by her recliner where she can use it as needed for knitting or when she is using her iPad! I injured my knee and it really has help with the pain and healing process.